A subsidiary of Japanese conglomerate Toshiba has won a contract to install its microgrid controller and energy management system in a 10-MW hybrid microgrid on the Maldives’ Hithadhoo Island. Hithadhoo Island, which forms part of the Maldives’ remote Addu Atoll, has its own, independent power grid. 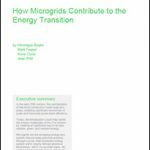 The microgrid will serve as the grid’s new core. Scheduled to go live in 2020, the microgrid will incorporate 1.7 MW of existing solar, existing diesel generators, and a 1 MW-0.3 MWh battery energy storage system (BESS). Toshiba Energy Systems & Solutions (Toshiba ESS) is working on the microgrid with project leader Nishizawa. Toshiba ESS joined with Nishizawa early on, helping assemble a project consortium and produce a tender proposal for the Maldives government. Nishizawa was awarded the microgrid contract last December, a Toshiba ESS’ spokesperson said. Adding the BESS to store energy produced by the solar PV system will help smooth out variable, intermittent flows of solar. 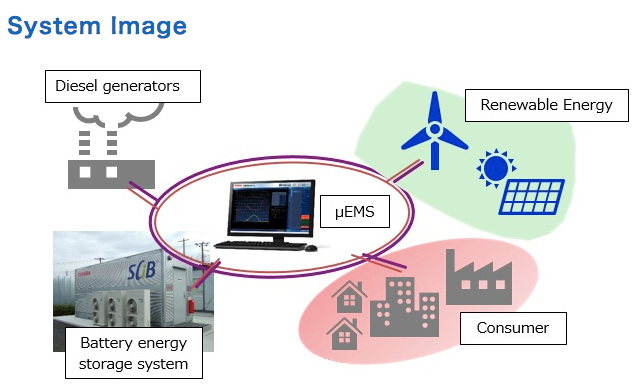 Toshiba’s Micro Energy Management System, or цEMS, will coordinate and manage the microgrid’s assets to optimize their performance and minimize use of diesel. Minimizing diesel fuel imports and costs, and reducing associated greenhouse gas (GHG) emissions and other forms of environmental pollution is a primary goal of the project, said the Toshiba ESS spokesperson. T.T. Network Infrastructure Japan Corporation (TTNI), a Toshiba ESS-Tokyo Electric Power Co. Holdings joint venture, conducted the project feasibility study. “TTNI calculated the effectiveness of the microgrid system and how the system can reduce fuel consumption and CO2 emissions,” the spokesperson told Microgrid Knowledge. Along the way, TTNI gathered the data to create fuel consumption curves for the diesel generators, electricity demand and other key generation, load and distribution system parameters throughout the microgrid’s service area, said the spokesperson. TTNI also calculated how, and by how much, fuel consumption would be reduced by цEMS’s operation, including by prioritizing the operation of diesel generators according to fuel-efficiency capabilities, stabilizing solar PV generation output by smoothing out fluctuations, and increasing the percentage of PV power flowing on to the grid. All told, the microgrid could reduce total diesel fuel consumption on the Hithadhoo Island power grid by 4.5 million gallons and carbon dioxide (CO2) emissions by 45,000 metric tons over the course of an expected, 15-year life, according to Toshiba ESS. Toshiba ESS has a long history of supplying energy management systems “for central load dispatch centers and SCADA [systems] for regional load dispatch centers. Both are for power companies,” Toshiba ESS’s spokesperson said. The company has been supplying its micro-EMS since the company began rolling out smart grid technologies commercially around 2000. Since then, the new energy technology has been deployed around the world, including as part of a microgrid system in New Mexico. The Maldives hybrid microgrid marks the first project funded by the Japanese Ministry of Environment’s Japan Fund Joint Crediting Mechanism (JFJCM). It’s also the first designed to enhance cooperation between Japan and developing countries to reduce GHG emissions. The project also falls under the umbrella of POISED (Preparing Outer Islands for Sustainable Energy Development),” a program funded by the Asian Development Bank, European Investment Bank, JFJCM and Government of the Maldives, that is promoting deployment of similar hybrid microgrid systems in the Maldives. 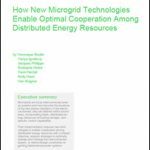 Track news about hybrid microgrids worldwide. Subscribe to the free Microgrid Knowledge newsletter.